Kolkata, February 7: When Mamata Banerjee ridiculed the interim budget, little did she know it will backfire on her so bad. While the nation progresses on the progress of the young generation, Mamata Banerjee has other plans. 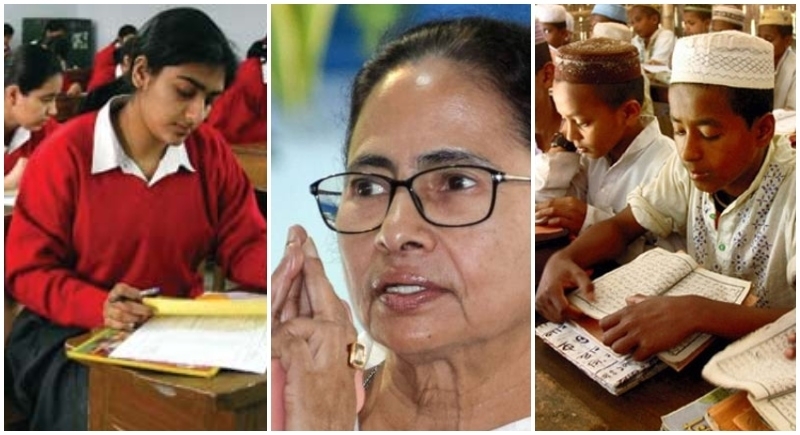 Slating the West Bengal Budget 2019, the state government notified that the budget for madrasa has increased to Rs 4016 crores compared to Rs 12 crores in 2006, this has increased 335 times in 13 yrs. Same time, budget for higher education increased just 5 times to Rs 3964 crores compared to Rs 760 crores in 2006. Implementing the madrasa education which particularly implies for the Muslim section has found a place in the state government budget. Compared to 2006 wherein the budget had allotted only Rs 12 crores for the education system has now increased to 4016 crores. This implicates that the state has increased the budget to 335 times more in the past 13 years. Besides the budget for higher education was increased just 5 times to Rs 3964 crores compared to Rs 760 crores in 2006. This clearly shows that the state government is liberating Muslim education more than the higher education for the students. The announcement for the budget was made by the state Finance Minister Amit Mitra in the Legislative Assembly. Is this Bengal or the state is walking on path of Pakistan? Ignoring the educational benefits to higher education and leaning to give more importance to madrassa education, the intention of the state is clearly signified. The budget claims giving jobs to around 9 lakh unemployed youths but are those jobs dignified for the youths? The budget claims industrial development but there is no progress in the state since Mamata Banerjee is in power for so long. The state of West Bengal has not seen any comparative progress in the coming years. With the tyranny rule of Mamata Banerjee, the people of the state are deprived from basic necessities. The people are deprived from having electricity in their houses whereas the entire nation is illuminating in bright light. People are deprived from having a ‘pakka ghar’ with broken ceiling and walls, while the poor in other states are living in concrete homes. The people of the state have not been given gas connections and are kept away from the basic necessities. The opposition of the state staged a clear disappointment over the budget and also ridiculed Mamata Banerjee for supporting Kolkata Police Commissioner Rajiv Kumar and covering up her scams in the Chit Fund case.